Feeling quite nostalgic my last days here! But my pain was assuaged considerably on Thursday evening by a lovely farewell dinner at Lisa’s and Ali’s, also including Ali’s sister and my American friend Colin. 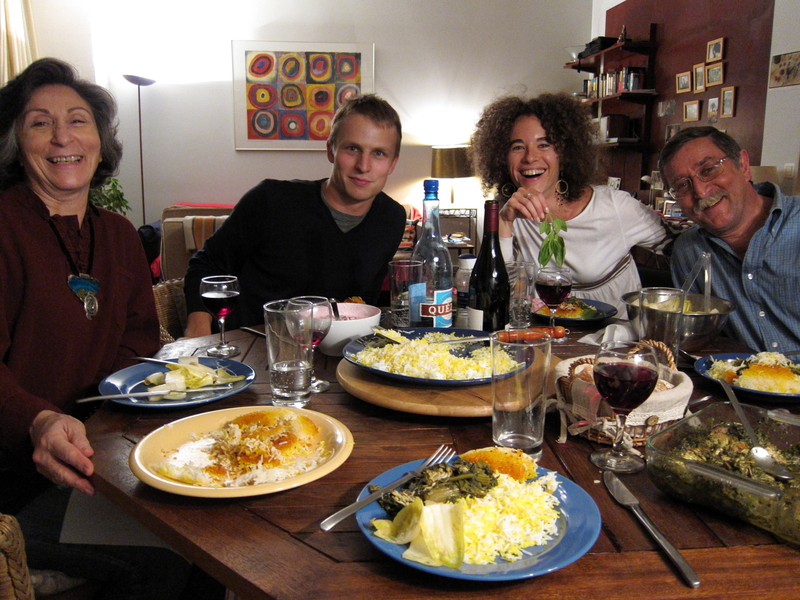 Ali’s Iranian cuisine was terrific, and I think everyone enjoyed themselves as much as I did. I had initially planned to see Dan for dinner on Friday night, but he contacted me early in the week to ask if he could “sleep on my floor” for a couple of nights. Needless to say, I offer a higher standard of accommodation to my guests! So he stayed over Thursday and Friday nights in unexpected comfort. Dan and I had dinner on Friday with his friend Johanna, starting with drinks at her fabulous and quirky apartment overlooking the Canal Saint-Martin. We ate at a peculiar little Asian vegetarian restaurant, Tien Hiang. Each of the dishes was described (in French) as including « chicken » or « beef » or some other meat, all composed of textured soy protein. The food was very good, but I couldn’t help thinking that the place catered to vegetarians who were pining away for a meat diet, or to couples in which only one was vegetarian. During the day on Friday I took an excursion from An Hour From Paris to the Parc de Sceaux, only a 15 minute train ride from Paris. It’s a glorious place, with an impressive château, lovely gardens, fountains, waterfalls and a kilometer-long Grand Canal. It was originally designed by André Le Nôtre, the architect of Versailles, for Louis XIV‘s right-hand man, Jean-Baptiste Colbert. 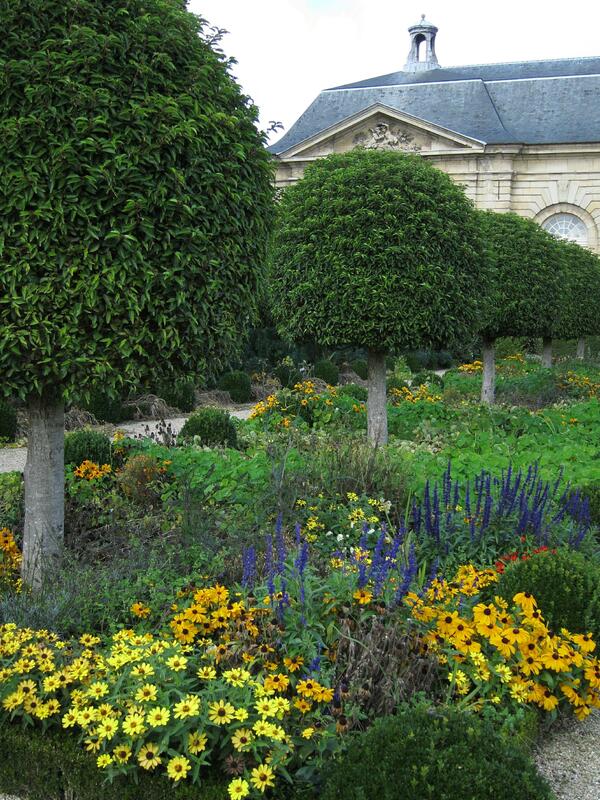 The château houses the Musée de l’Ile-de-France, a charming hodge-podge well worth half an hour of your time. 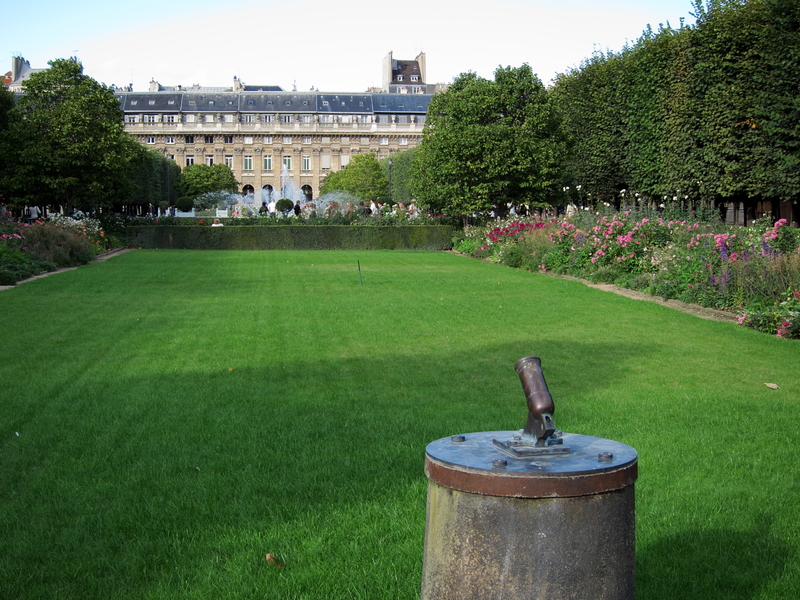 The park’s little secret, however, is that the only original building is the tiny Pavillon de l’Aurore. The current château dates from the 19th century, and the park itself is an early 20th century restoration. 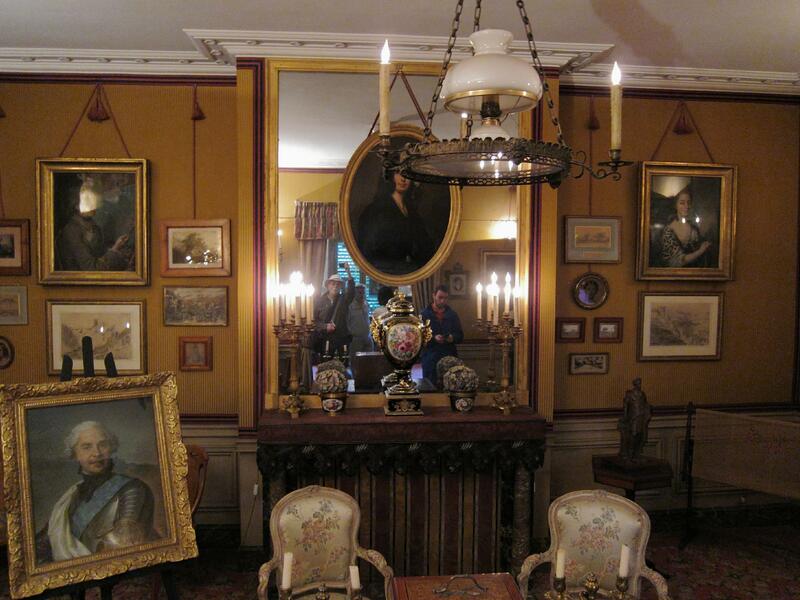 Despite its dodgy provenance, the place is delightful and fully expresses the 17th century vision of its creators. My photo set is at: Parc de Sceaux. Saturday, after Dan left, was mostly spent blogging and cleaning. After an uneventful checkout I attended Elliot Marks’ birthday party. He cooked up a storm! Colin and Andrew were there, as well as other Harvard and non-Harvard guests. I was particularly pleased to meet Elliot’s partner Pierre. I made it an early evening, however, since I fly to Marrakesh tomorrow. 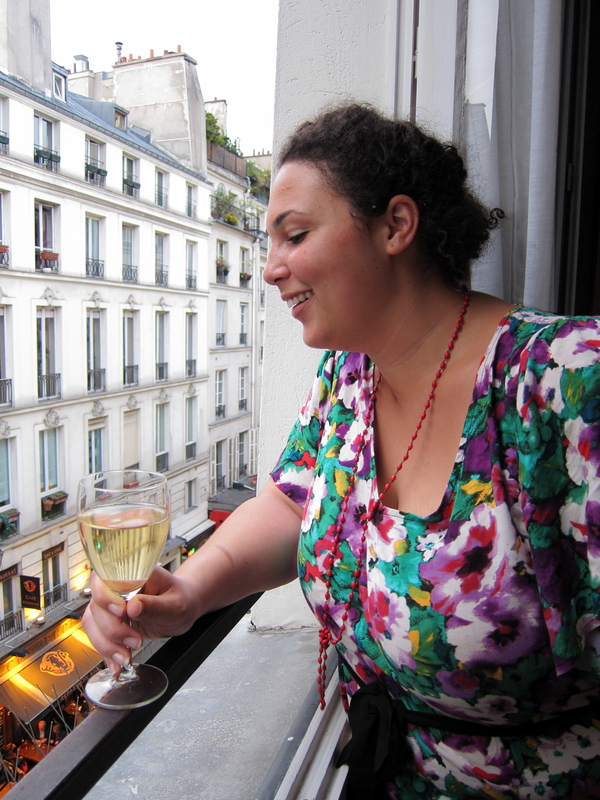 These last days in Paris seem likely to be a merry-go-round of farewell coffees, dinners and distractions. Fun for me but perhaps less interesting to my gentle reader(s?). I’ll try to highlight a few amusing moments, though. After a morning largely spent scheduling and re-scheduling I met up for Tuesday afternoon tea at the Open Café with two old friends and a new one: Elliot Marks, an expat who has lived here for ten years and coordinates HGLC’s Paris chapter; Colin Chamberlain, a Harvard grad student doing a thesis on Malebranche; and Andrew Hamilton, a fellow Harvard grad student and friend of Colin’s. 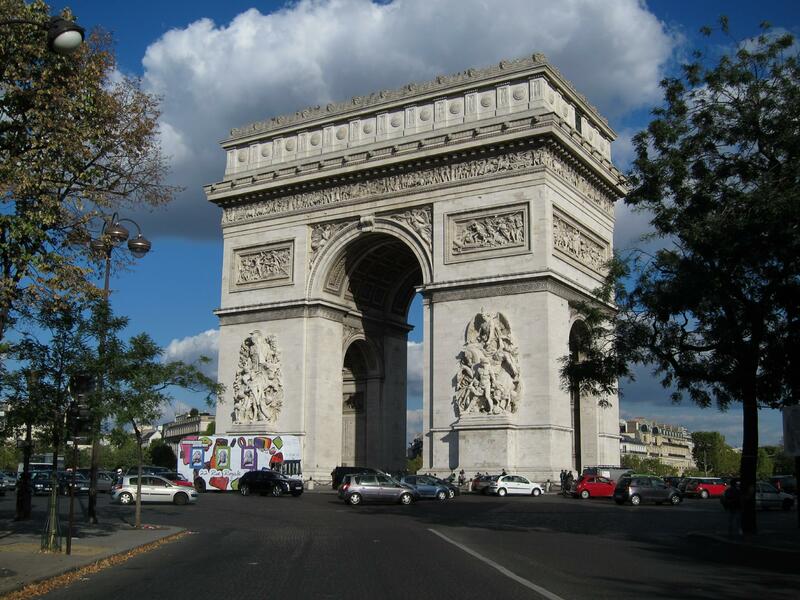 Colin and Andrew have just arrived in Paris, each starting an academic year here. I thought Elliot might enjoy meeting Colin and Andrew, and vice-versa. 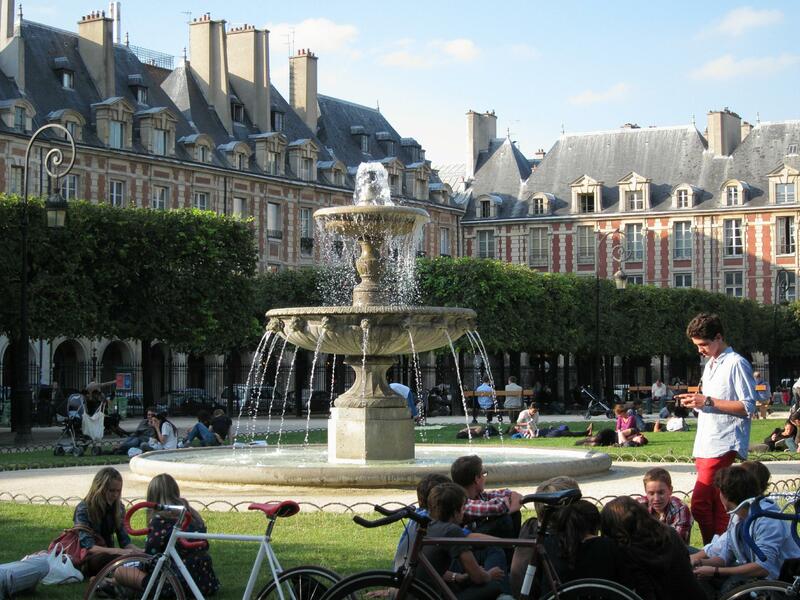 I also thought that the arrival of new Harvard folks might spark an HGLC Paris event. Dinner was with Alexis, whom I had met in 2010 through mutual friends. He first took me on a walk through the 10ème, where he now lives. Some areas near the train stations were quite run-down but other parts were energetic and trendy. 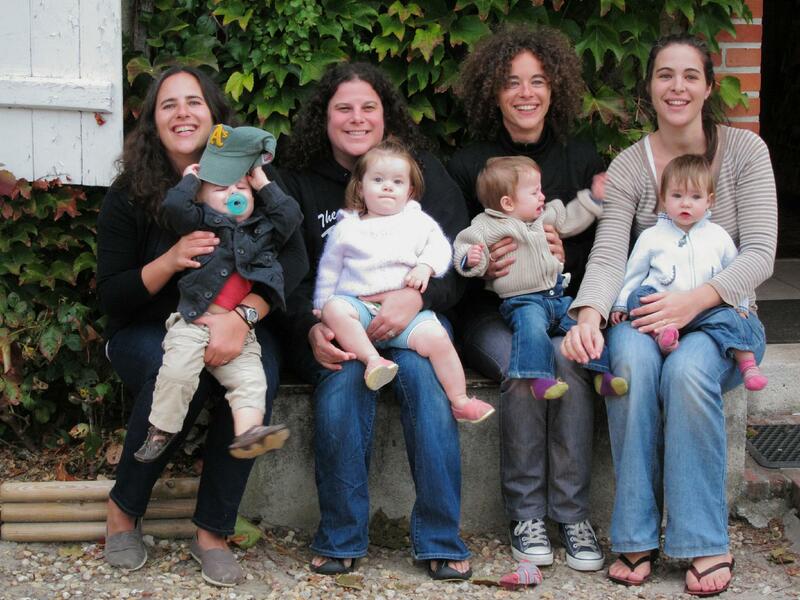 We had a good dinner at a cute restaurant near the Canal Saint-Martin called Les Enfants Perdus (the lost children). 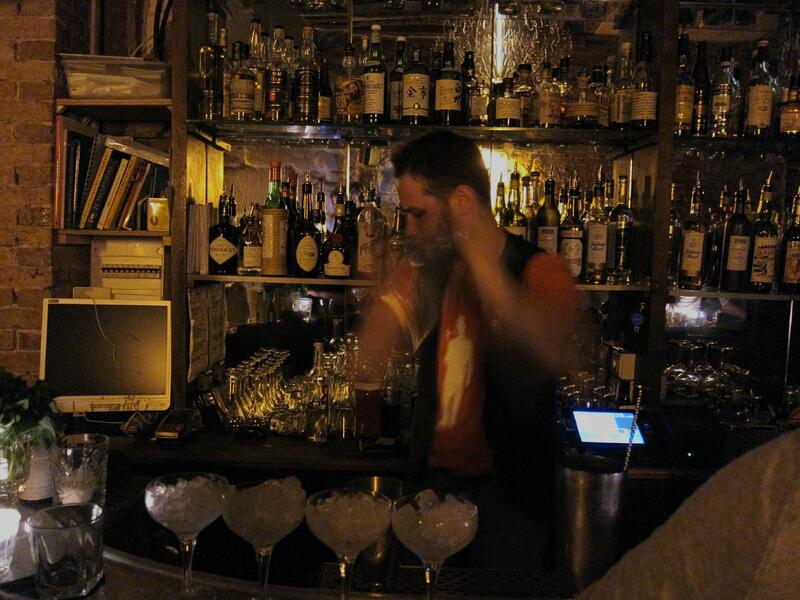 I liked the atmosphere as well as the food; the service was somewhat attitude-y, but in a rather endearing way. Alexis lived in the U.S. for four years, most of the time a few blocks away in Central Square, Cambridge, though we didn’t meet until he had moved back to France. He has a deep interest in American politics and culture. I struggled to hold up my end when the conversation turned to U.S. congressional races, though I felt more comfortable discussing the National Popular Vote Interstate Compact. 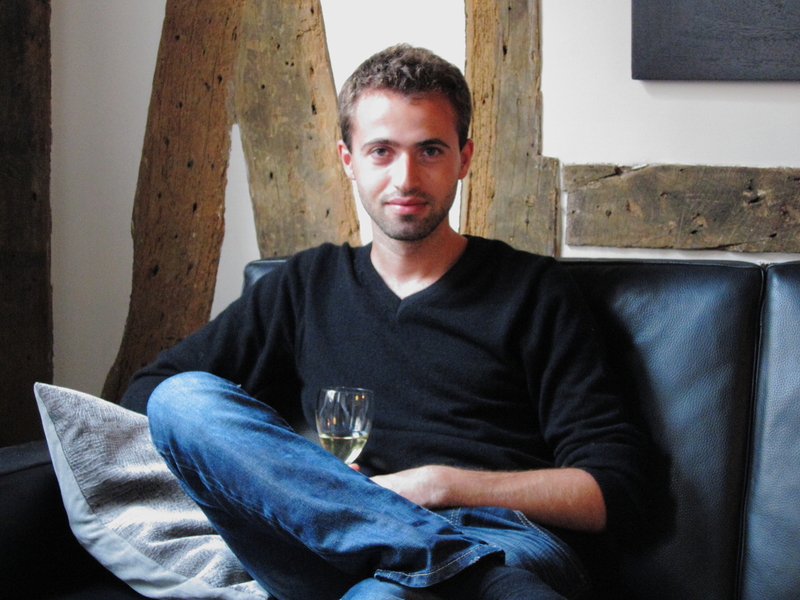 Alexis is one of the more trenchant critics of my pretensions as a flâneur, but he also takes my ideas more seriously than most, so our discussion of tourism, the pleasures of travel and nostalgia were especially rewarding. Alexis mentioned at the end of the evening that this was the first day that really seemed like fall. The first part of September was full-on late summer, but in the last several days it has been cooler and cloudier, with occasional drizzle. I have enjoyed the weather here, but I also enjoy fall in Boston. Another year I will probably consider returning in May and/or June rather than in September. 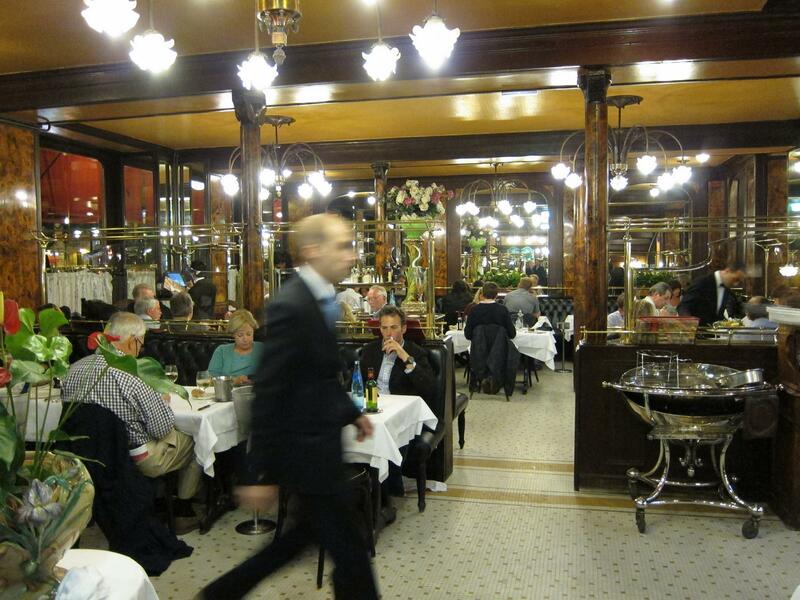 If it’s Wednesday it must be … farewell dinner with Jacques at Brasserie Bofinger. 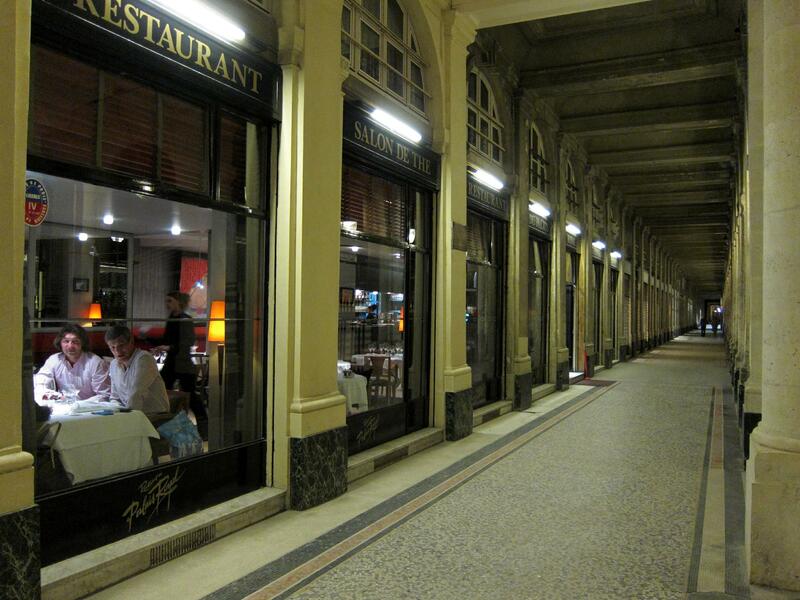 I had proposed some trendier places but Jacques really prefers traditional brasseries, and I can see why! 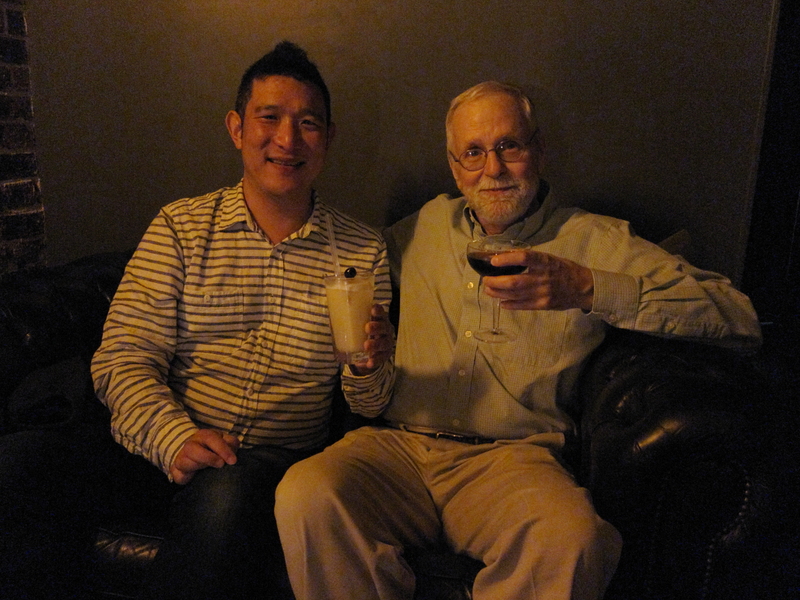 Here’s my full photo set: Farewell Dinner with Jacques at Brasserie Bofinger. 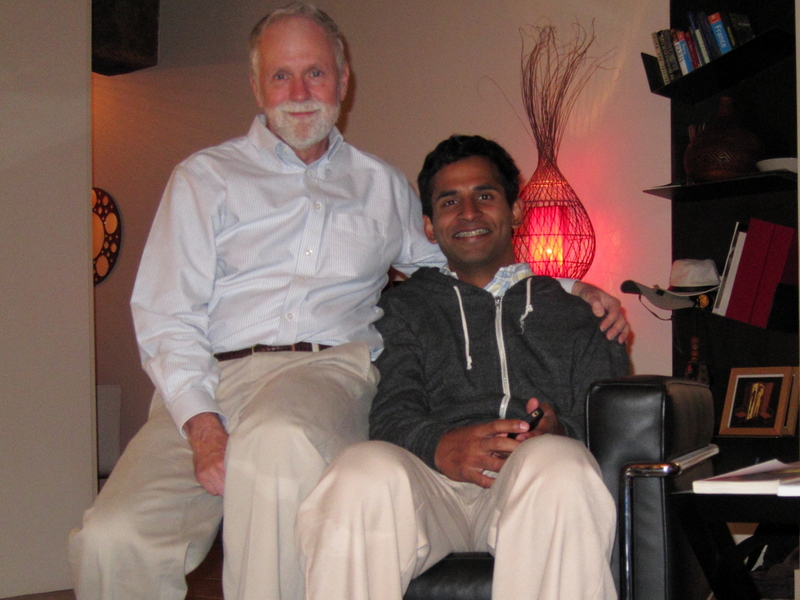 Jacques and I have been friends since my first month here, April, 2010. While it’s always sad to say goodbye, it’s good to know that he’s doing well and that I can always expect his kindness and friendship. Inspired by Monet’s haystacks, here are two views of the Stravinsky Fountain and Saint-Merri, near the Pompidou center. 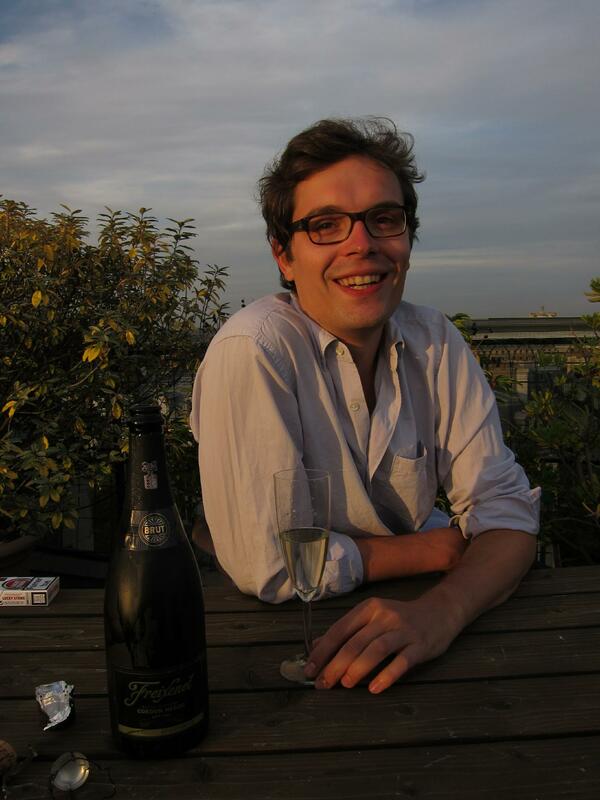 Andrew is working this year as a fellow at the musée du quai Branley, a relatively new museum of non-Western art (which of course nobody today would have the temerity to call “primitive”). I wonder what scholars of future ages will make of the artifacts that our civilization leaves behind? 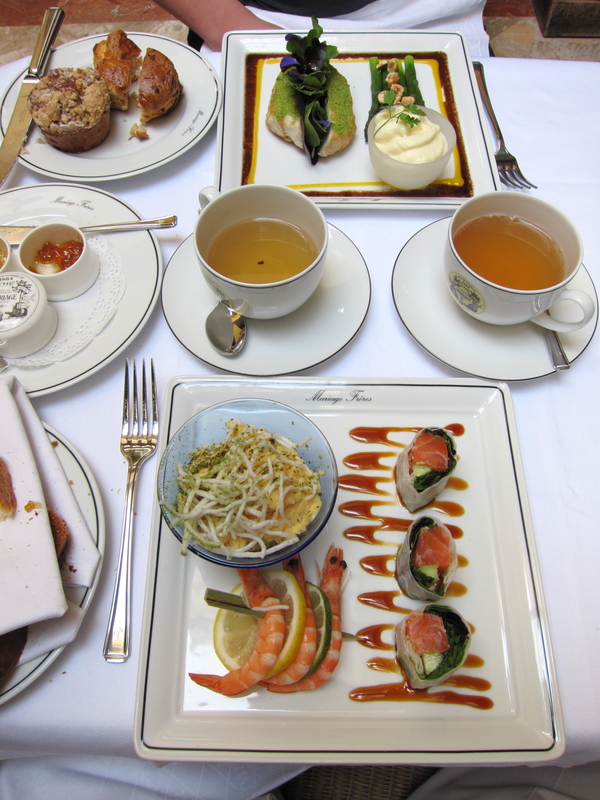 On Sunday we had a leisurely tea-themed brunch at Mariage Frères in the Marais. Despite being 100% touristy this place provides a really delightful experience. There was a little annoyance just at the beginning when they proposed to seat us in a dark corner, but we asked for a better table and were given a great one after just a short wait. After that the service, as well as every other aspect of the experience, was impeccable. I remarked to Gerry on the calmness and relaxation I have felt each time I have been here. After brunch and a bit of shopping we headed to Rosa Bonheur, in the Parc des Buttes Chaumont, which you may recall my visiting with Jared two Sundays back. We got there shortly after 4:30. There was a fair number of mostly-straight people at the picnic tables, but no barriers and nothing like the mob of gay men I had enjoyed two weeks earlier with Jared. I was concerned that there had been something special about the previous afternoon — the perfect weather, the fact that it was the first Sunday after the Rentrée, or some other Parisian mystery. That would have been unfortunate, since I had given the place something of a build-up to persuade Gerry to put it on our Sunday agenda. Although not quite sunbathing weather it was pleasant enough to sit outside, so we got a couple of beers and squeezed onto a table between a straight group and three gay boys on the other. The straight group was first replaced by a young straight couple, who were adorable and friendly. 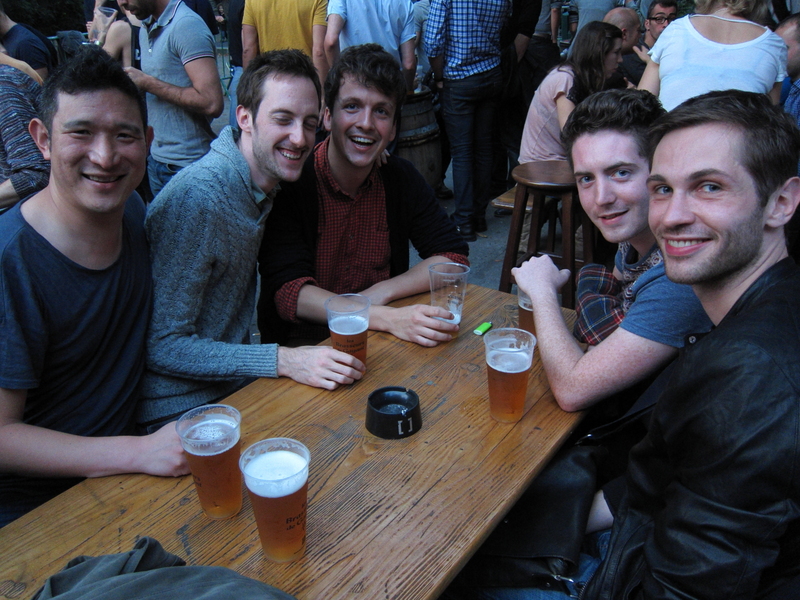 They polished off a bottle of rosé, then were replaced by several gay men in their thirties. We found occasion to talk a little or a lot with just about everyone at the table, even though we didn’t make any new Facebook friends. Needless to say, my anxiety about nobody showing up proved unfounded. By 5 pm a crowd of guys had arrived, and shortly after the barriers went up and a line started to form. If anything there were more people today than two weeks ago. It was nice to be insiders, with our own share of a table! After several more beers we took the métro home. I did laundry, blogged and got to bed (relatively) early, while Gerry went out to make the most of his last night on the town. While I have another week here I leave next Sunday so this will also be my last Rosa Bonheur, for a while at least. Initially we were told that the elevator from the second level to the top was broken, and we would get a partial refund. But happily it started working again so we got all the way up. The height at the second level didn’t bother me, but I felt a bit uncomfortable on top. It seemed as though the floor moved slightly as people walked on it, and the angles prevented you from seeing any supporting structure. Dinner was at another of my old favorites, Le Loup Blanc (which closed in 2014). 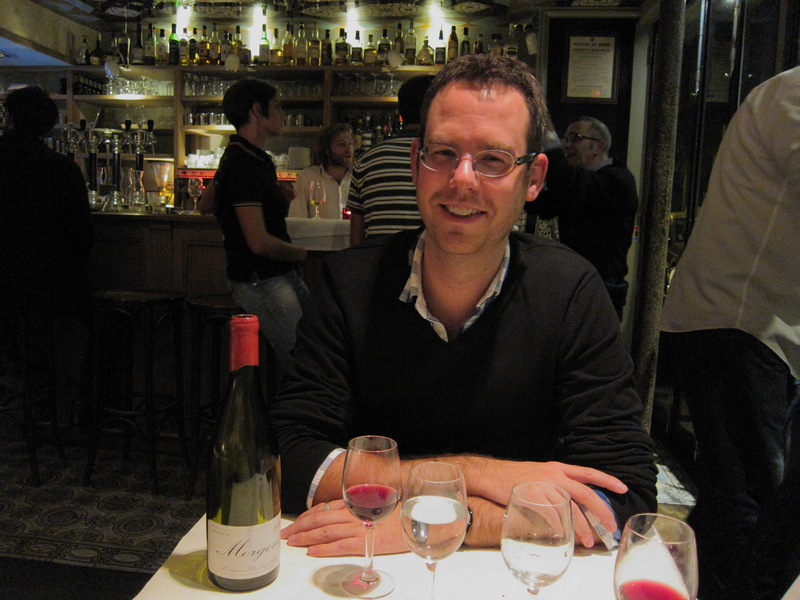 We enjoyed the ambiance as well as the food, and an excellent half-bottle of Saint-Emilion Bordeaux. I was pleased to re-establish my friendly nodding acquaintance with a particular cute waiter, who had seemed distant earlier in the trip. After dinner Gerry and I headed over the Marais to further explore the bar scene. We started at Spyce [Now Closed], which was jammed with an attractive mixed crowd. One enters this bar through a small lobby, with two doors, each operated by a bouncer, that are never open at the same time. This is evidently to keep the music from disturbing the neighbors. I asked two unusually hunky guys if they would be in a picture with me. They graciously agreed, and only later did we realize that they were two of the evening’s three dancers. This only whetted our appetite, however! We continued on to an even spycier club, Raidd, which specializes in “shower dances.” Gerry boldly pushed through the crowd to get us a prime position near the shower stall. Shortly after we were rewarded with a fine performance by a gifted young man. 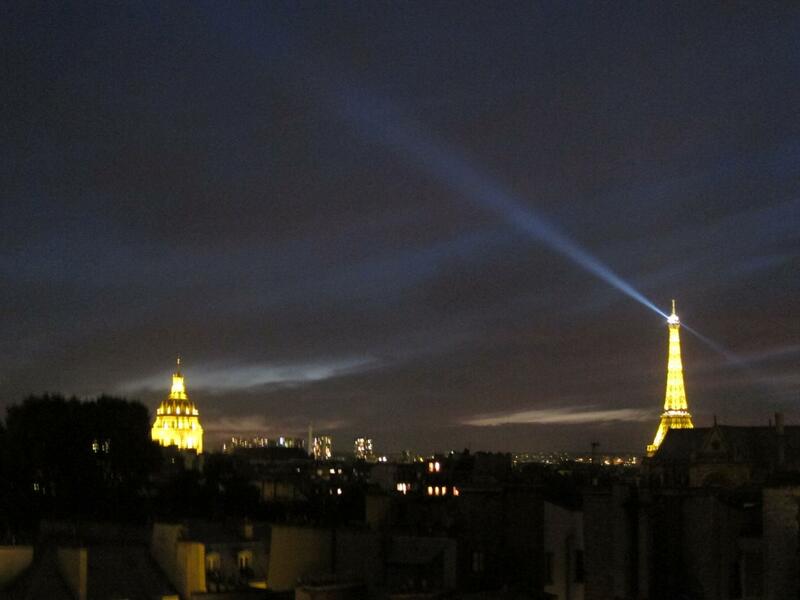 I have cropped my photos so as not to épater la bourgeoisie, but in fact very little was left to the imagination. Update: Here’s a video of a more modest shower dancer in 2016. Saturday morning we slept in, for obvious reasons! 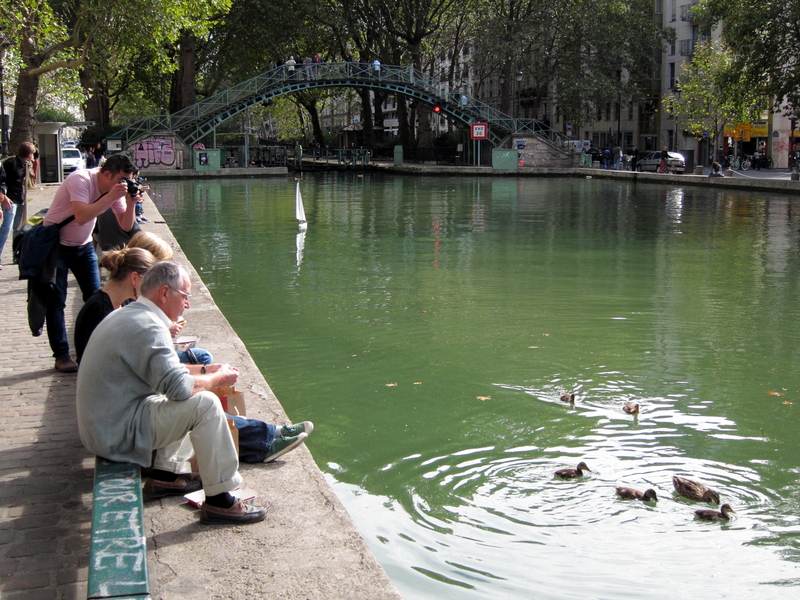 When we roused ourselves I took Gerry on a walk across the Haut Marais to the Canal Saint Martin. I took him via the linear park atop the last covered portion of the canal, and I invited him to puzzle out what the wire-covered ventilator shafts were there for. Just as he was figuring it out we came on the tunnel opening and the first lock. We had a very good lunch at Chez Prune, on the banks of the canal. While there were other tourists there, it had an authentic-seeming bohemian atmosphere. After a circuitous walk home and a disco nap Gerry took me out to Le Pré Verre, which I had enjoyed on previous visits. While the food was good the service was brusque and sloppy. The menu was both in French and English (though I admit that this was convenient), and none of the diners in our vicinity were French. I realized that this restaurant is predominately fed by its Rough Guide listing, where I had seen it four years ago. What seemed like an insider’s secret then now seemed relatively banal. After dinner we walked along the Seine to — of all places — the Palais Royal, to try out yet another bar, Club 18. We were a few minutes early so we strolled around the area until midnight, when it opens. It initially seemed odd to find a gay bar in a place so steeped in history and literature, yet even in Balzac’s day the area was a hotbed of gambling and prostitution, so I guess it’s not really so different. The club has a tiny dance floor, but an amazing number of guys managed to squeeze their way in. 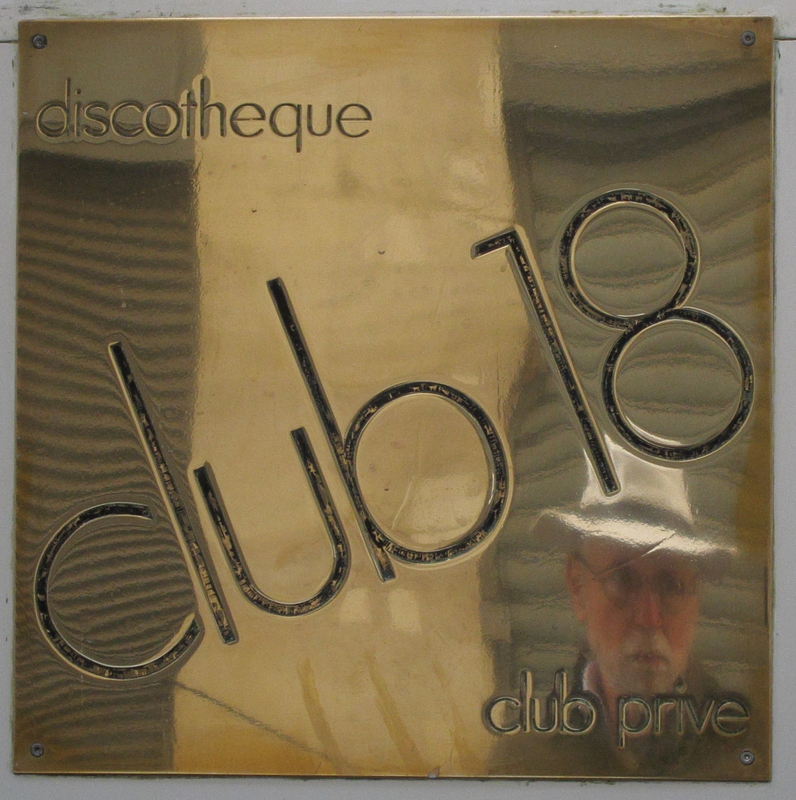 At times it seemed as though it should have been called “Club 16”, but there were other older men and on the whole it seemed more friendly and comfortable than not. 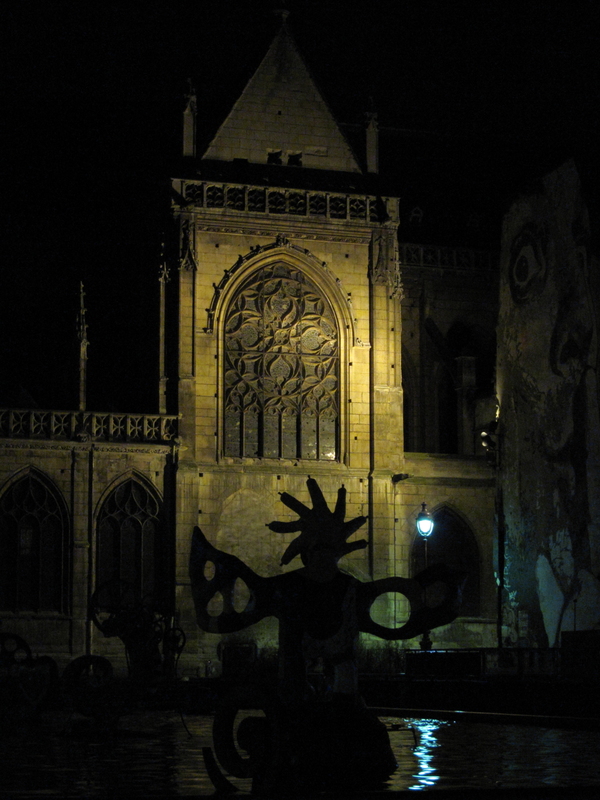 We danced until about 2:30 am, then strolled back to rue Montorgueil. Several bars and cafés were still open, while others were just closing up. My own assessment is that Duplex and the Open Café seem to offer the best chance for conversation. Spyce [now closed] and Raidd have the hottest dancers, but eye candy gets old rather quickly, and guys primarily drawn to that form of stimulation are less interesting anyway (present company excepted). Club 18 is a really fun place to dance if you didn’t mind being jammed in like sardines, and the crowd was very attractive, even though in some cases actually too childish-looking. 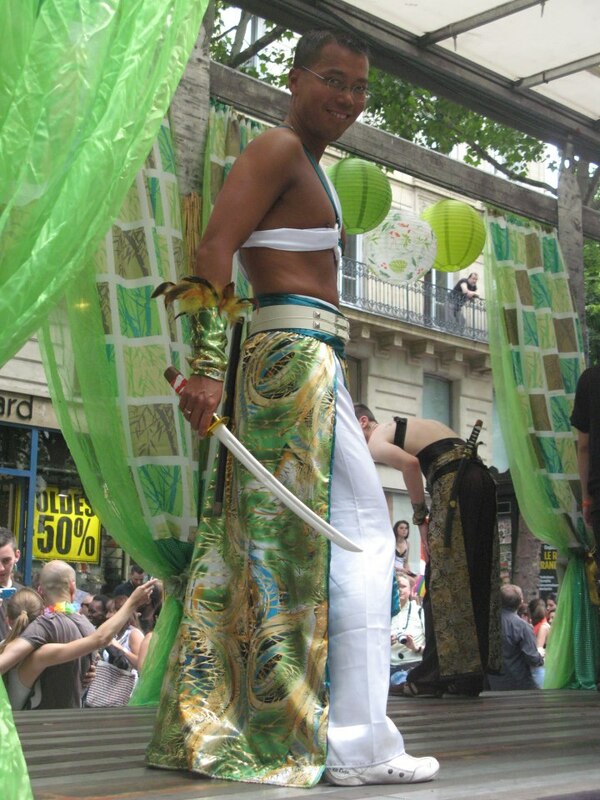 On the whole, the Paris gay scene is good, and I can imagine going back to any of those places at some point or another. If it’s Wednesday this must be … the Louvre! I walked Gerry over since he was still getting oriented (and still waking up around noon). My initial thought had been to leave him to it, since I’ve been so many times, but there was hardly any line, so I was swept along into another encounter with its vast beauties. 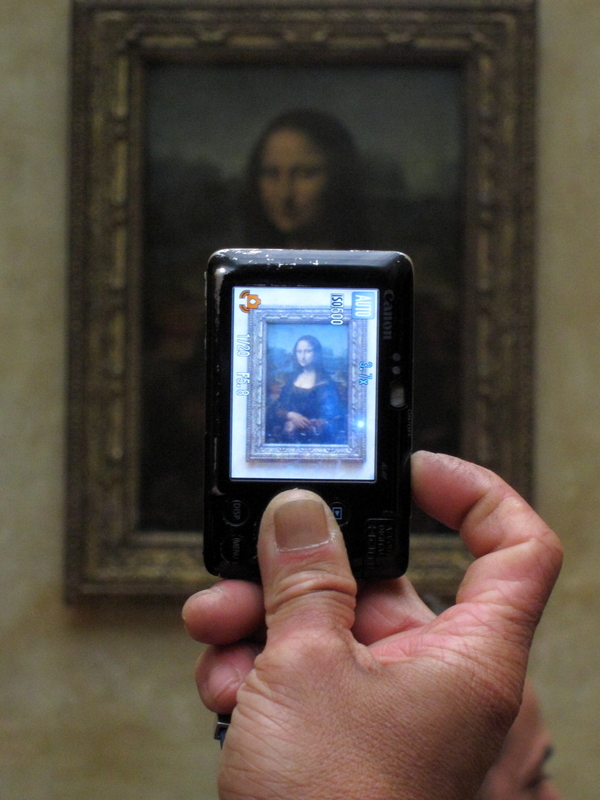 As a first-time visitor, Gerry made a beeline for the Mona Lisa. 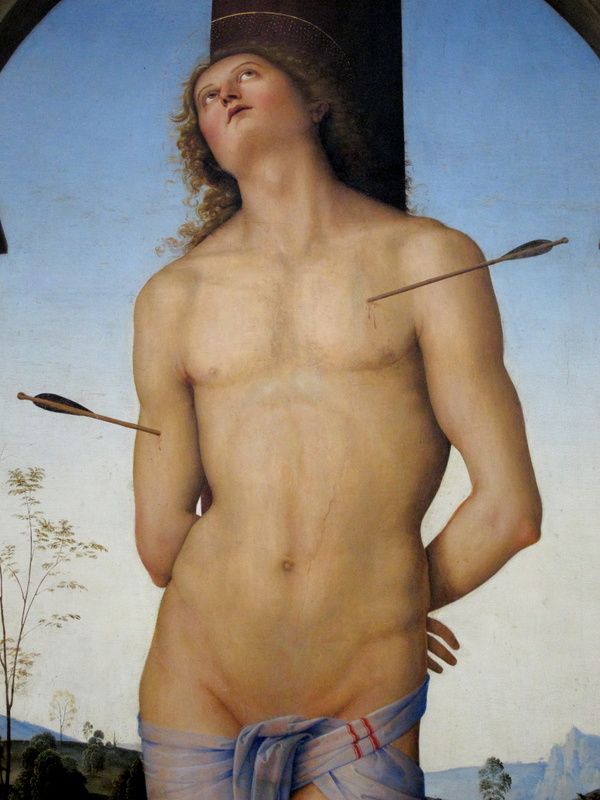 Saint Sebastian by Pérugin (detail). Around 1490-1500. 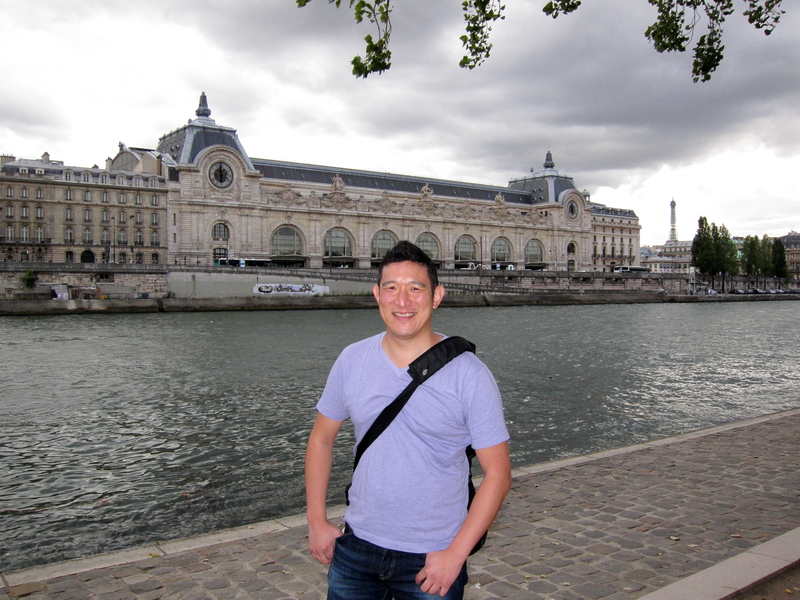 I also added a few more photos to my Paris Louvre Picasa Album. As it happened, two friends of Gerry’s were also visiting the Louvre that day so we met up with them. They were a nice couple, but I preferred to take my separate way through the collection. Moving between works and rooms is complicated even with one other person — tho Gerry and I do this comfortably — but with a larger group I find museum-going excruciating. By coincidence we all finished around the same time and met for a walk through the Tuileries gardens, across the Place de la Concorde, then along the Champs-Élysées, to the Arc de Triomphe. I had to stand in the road, risking life and limb, to snap that shot. Postcard-worthy, no? He is doing great, working hard at a top accounting firm and enjoying leisure time with his long-standing petit copain (boyfriend), who knows about and accepts our friendship. It was great to see him again, and we planned one more meal together before I leave. After Jacques headed home Gerry and I met by chance on rue Montorgueil and ended the evening at the Experimental Cocktail Club comme d’habitude (as usual). It was another cozy interlude, with good music and atmosphere. We got into a lively conversation with a good-looking young man across from us until his friends said (in French) “are you with us or with them?” After which Gerry and I had to make do with one another’s excellent company. 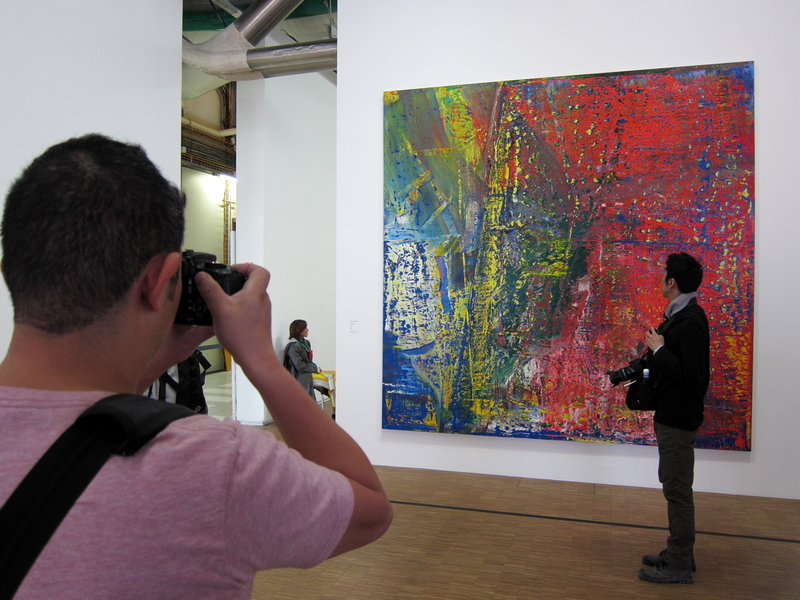 If it’s Thursday it must be … the Pompidou! 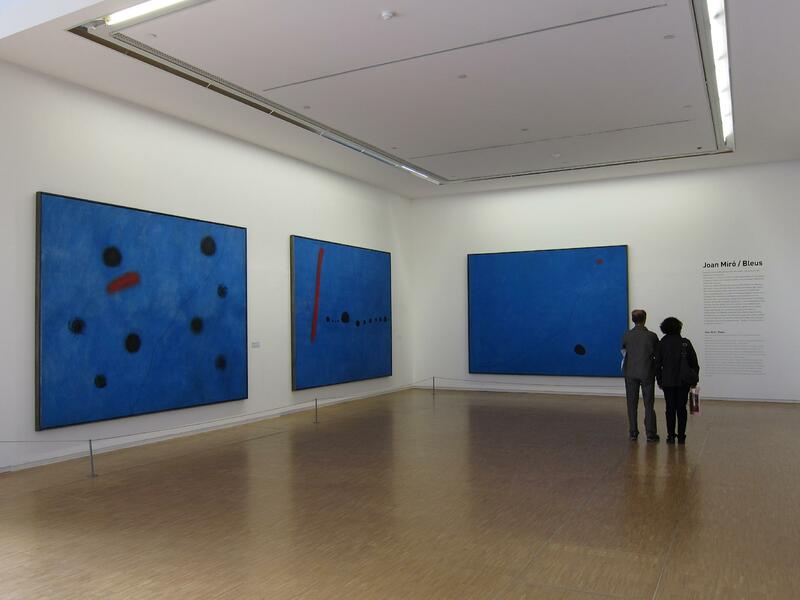 This is a fine collection of modern and contemporary art, in a building that is itself an icon of modernity. I enjoyed seeing the permanent collection again as well as an exhibition of the remarkably varied work of Gerhard Richter (which ends on Monday). Thursday evening I had planned dinner with my cousin BJ, starting with an apéro at my place. She emailed that morning to ask whether some friends she had also been meaning to catch up with could join us, and of course I said yes. The new recruits turned out to be two of her former boyfriends and an interesting older woman. When the first ex arrived he mentioned that he had just left two of his own friends at a café downstairs, so naturally we invited them up as well. Before I knew it I was hosting a party for eight or nine people! Several brought wine and I had some provisions on hand so it was a convivial start to the evening. Most of us stayed for dinner at our new favorite, Lézard Café. 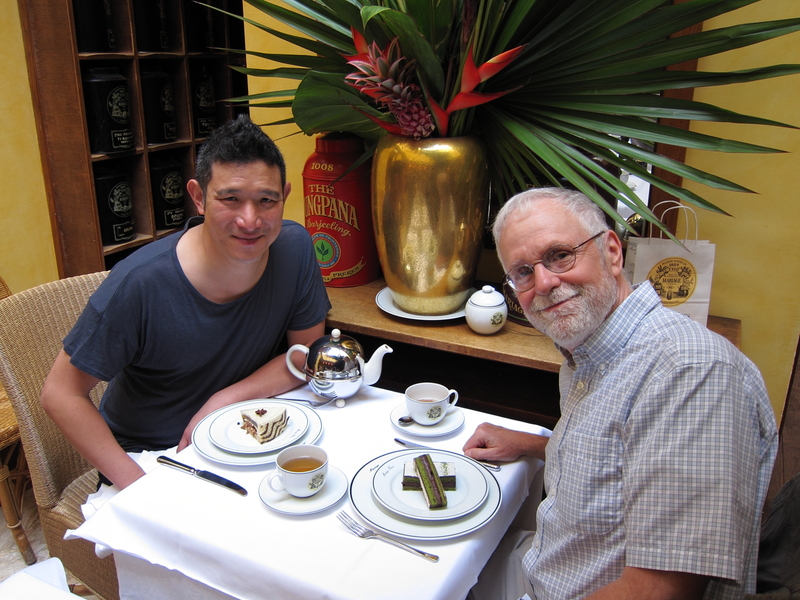 It was once again a really nice experience — good food and friendly (if slightly giddy) service. At one point I did a double take because there was a handsome young man who I didn’t at first recognize sitting at the other end our table conversing with animation. With a pleasant little shock I realized that he was our waiter! 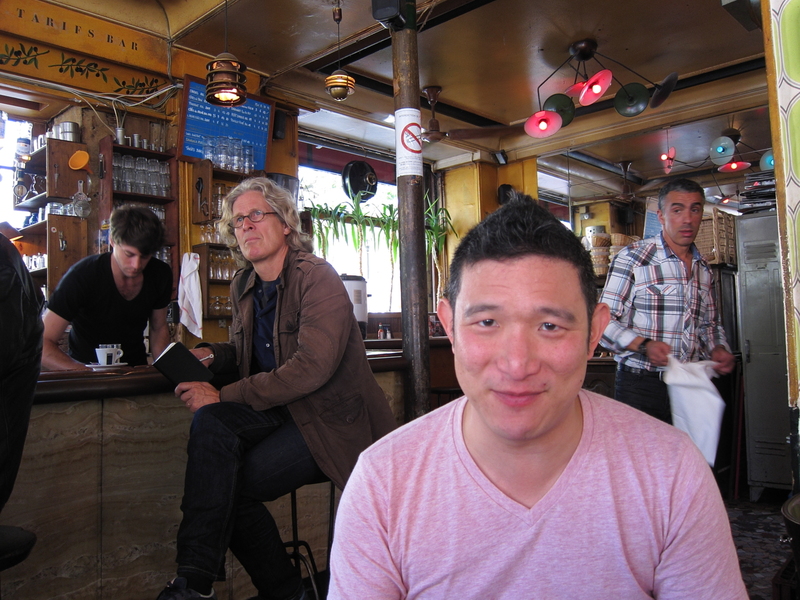 After saying farewell to BJ, her friend — and our new waiter friend — Gerry and I headed over to a bar in the Marais, Duplex Bar. It was a lively place, with an attractive and friendly crowd and relatively low attitude. We stayed until closing, at 2 am, lingering on the sidewalk to see whether two guys who seemed to have met for the first time that evening would go home together. They left as part of a foursome, leaving us to wonder whether they were a ménage à quatre (“household of four”, playing on the phrase ménage à trois) or, perhaps (recycling a French friend’s witticism), a manège à quatre (“merry-go-round of four”). Gerry arrived as scheduled on Monday morning. Not only is this his first visit to Paris, but his first trip to continental Europe (not counting a few days in Iceland). 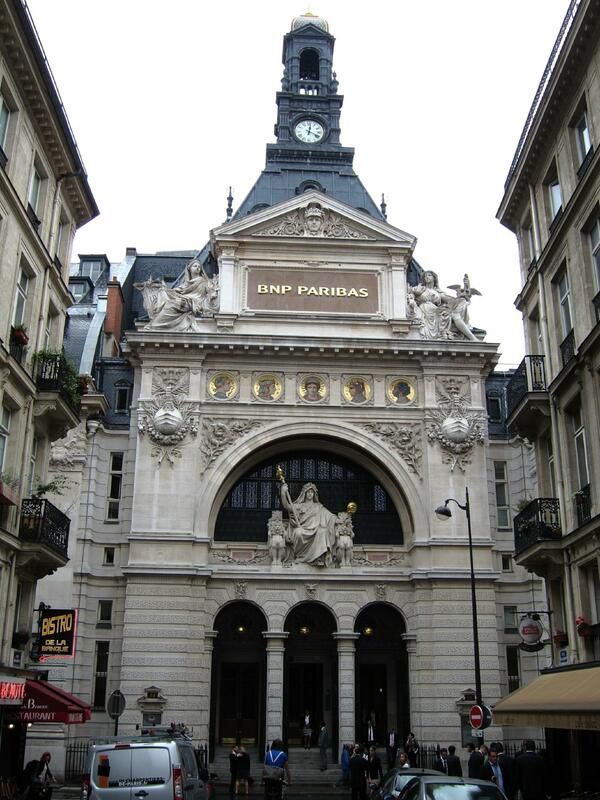 He came into the city, at my suggestion, by RoissyBus to L’Opéra, and I met him for coffee and croissants at the fabulous Café de la Paix. While this worked out eventually, there were two problems. First, there was a chaotic mob scene — un bordel — getting onto the bus, and Gerry had to stand the whole way. The bus is in theory more tourist-friendly but I’m going back to recommending and using the RER train, even though the stations can themselves be confusing. Cabs cost about 50 euros, so also a viable if pricey option. Secondly, Café de la Paix was a poor choice for a rendezvous: the terrace didn’t open until after 9:30, it wasn’t visible from the RoissyBus stop, and it’s snooty and overpriced. It would have been smarter to meet at L’Entracte. 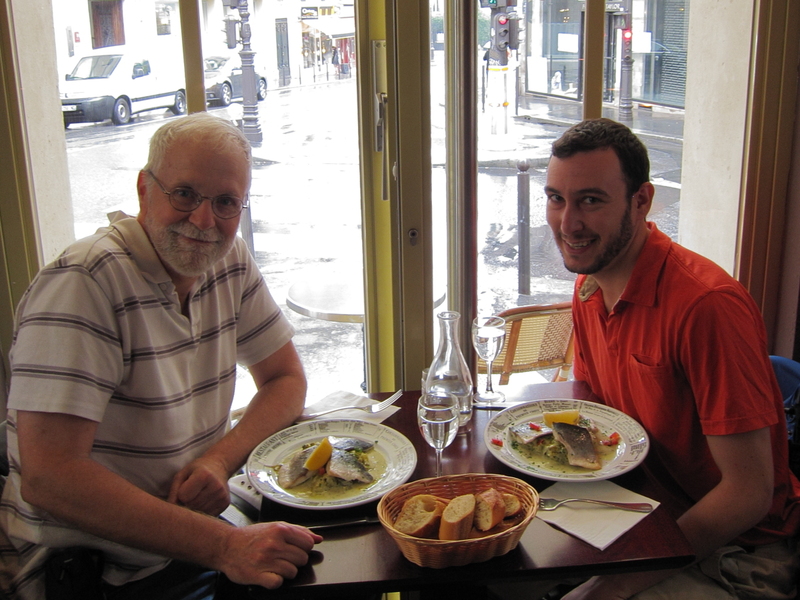 After Gerry settled in to the apartment we set out on a flâne, which, as luck would have it, led us to a charming lunch at my old favorite, L’Absinthe Café. At one point the waiter switched to English, but after I expressed a preference for French he gave my use of the language a cheery semi-compliment: that he was able to understand everything I said. For dinner our first night Gerry chose a restaurant just a few blocks from my apartment that I had passed many times but never eaten at. We both loved Lézard Café , at the intersection of rue Tiquetonne and rue Étienne-Marcel: The location is lively but not noisy; service, servers and the other diners were delightful; the food was tasty and well-presented; the wine was luscious; and everything was reasonably priced. A new favorite! 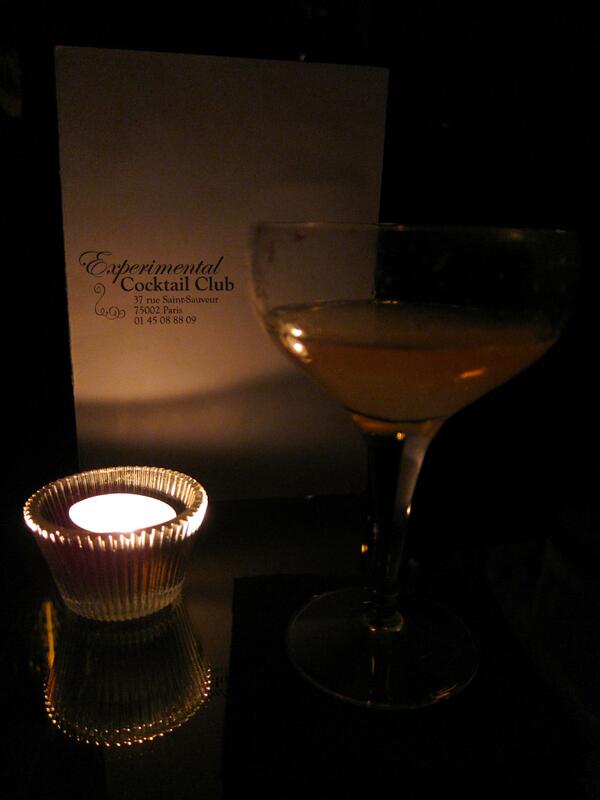 We rounded out the day with a couple of creative cocktails at Experimental Cocktail Club, just a few doors down from my place. I was pleased to be greeted by one of the owners as if I were a regular! 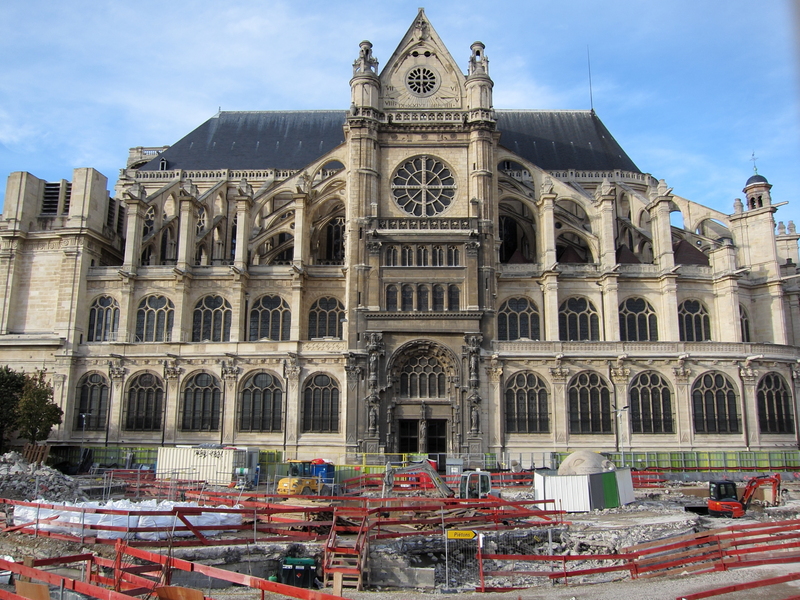 After a somewhat slow start, due to Gerry’s jet lag, we set out around 2 pm on Tuesday for the Musée d’Orsay. I was pleased to find that the impressionists had been moved back up to the top floor. It seemed as though quite a few more were on display than I remembered from last year, when they were off the main hall. The lighting and presentation was exquisite, and I was blown away as always. Once a year is not too often to revisit these glorious paintings. We walked back via the banks of the Seine. 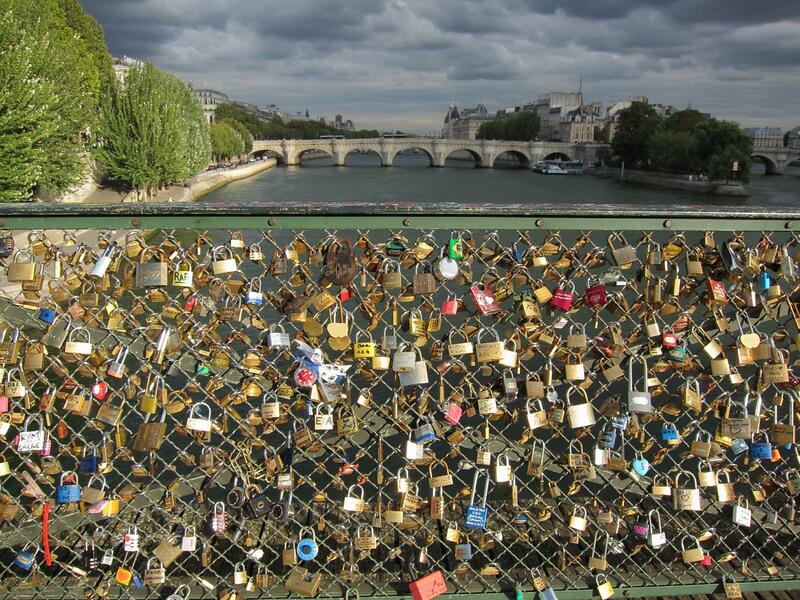 Gerry particularly enjoyed the locks placed by lovers along the Pont des Arts. 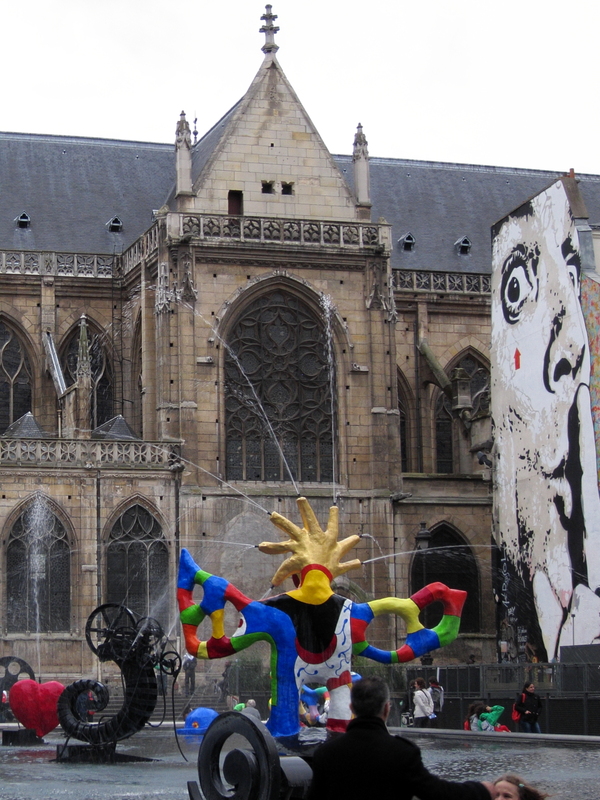 I took us home by a different route through the Marais, then up a cute little street in Beaubourg, rue Quincampoix. There we encountered, on a Tuesday evening, not one but two gallery openings, vernissages. 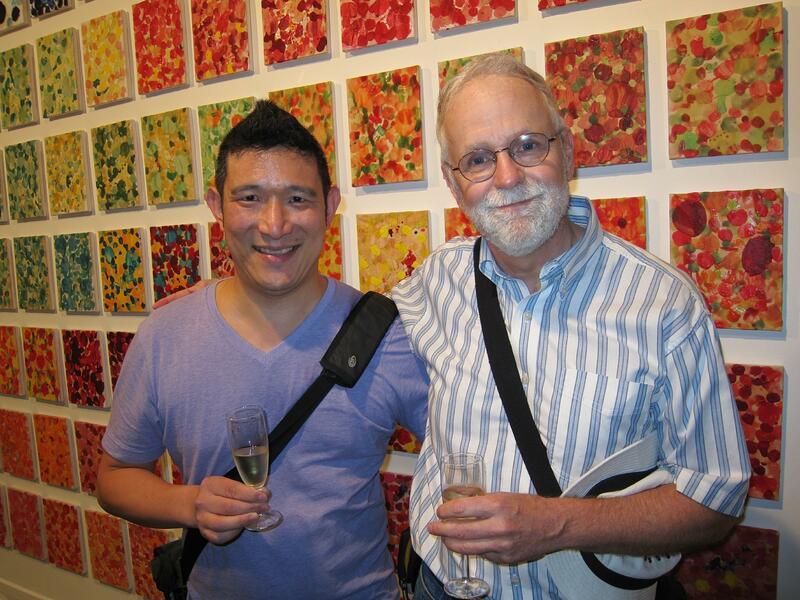 We really liked the art at the second one, and as one might expect the wine was also excellent. We had dinner at a quirky and charming little place in my neighborhood, Le Bouï-Bouï, which I have enjoyed on several occasions. While the possibility of further adventures was mentioned we decided to make it a (relatively) early evening. 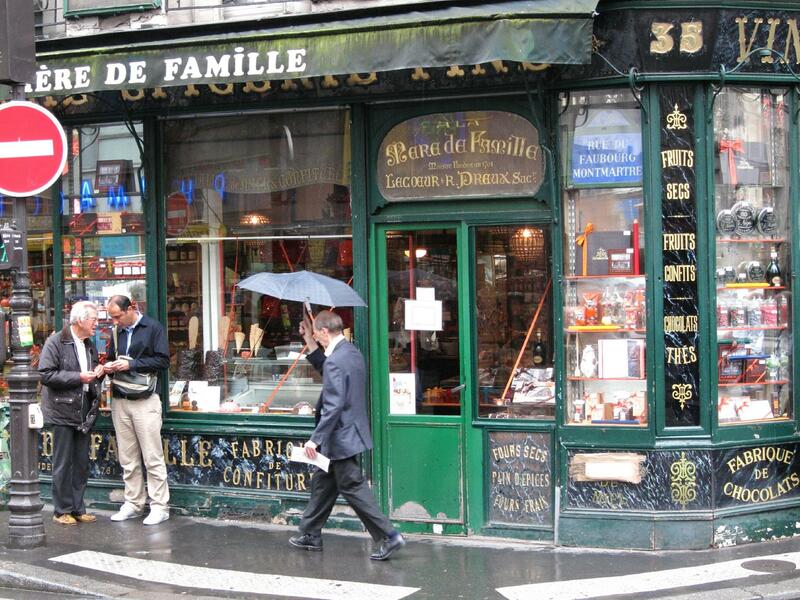 Mot du jour: bordel, a bordello or, more commonly, a chaotic mess. I spoke a bit too soon in my last post about my Sunday being uneventful. Shortly after posting I got a call from my French friend Antoine, inviting me over to see the view from the roof deck above his new apartment, in Saint-Germaine-des-Près, in the 7ème. He has free access to it when the owners are away, so this might have been the only chance I’d have to see it. I snagged the bottle of champagne that Lisa and Ali had brought the first night, then headed for the métro. The roof deck affords a 360° panorama of the Paris skyline, including nearly all of the most famous monuments, obstructed only by two nondescript modern buildings in the middle distance. And the excellent champagne further enhanced our appreciation of the unique place and charming moment. After sunset most of the monuments are illuminated, affording another lovely perspective on a lovely city. As one says here, pas mal ! 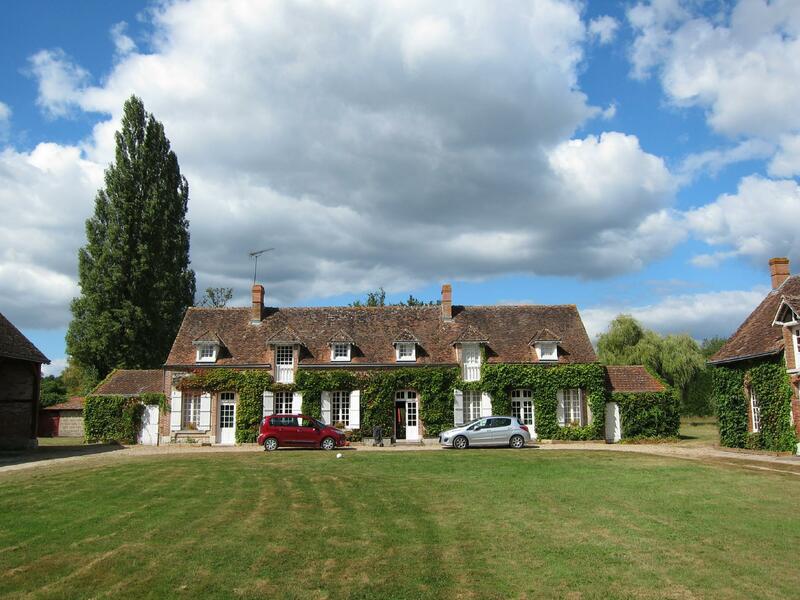 The centerpiece of my visit this year was a reunion of Mack cousins at their estate 2-1/2 hours south of Paris, generally for fun but particularly to remember my Aunt Jane, who died in May. We had all gotten together the previous year at Clear Lake, Iowa, and had an excellent time. While I could see then that Jane was frail, it had been gratifying how much she enjoyed her growing family, including quite a few great-grandchildren. One of her last wishes had been that the family would stay close. The house sleeps 14, but we were nearly twice that, so we also filled two nearby houses owned by family friends. I soon spotted a critical issue: we had many thirsty Macks, lots of warm beer, and only a small refrigerator, already full of food. 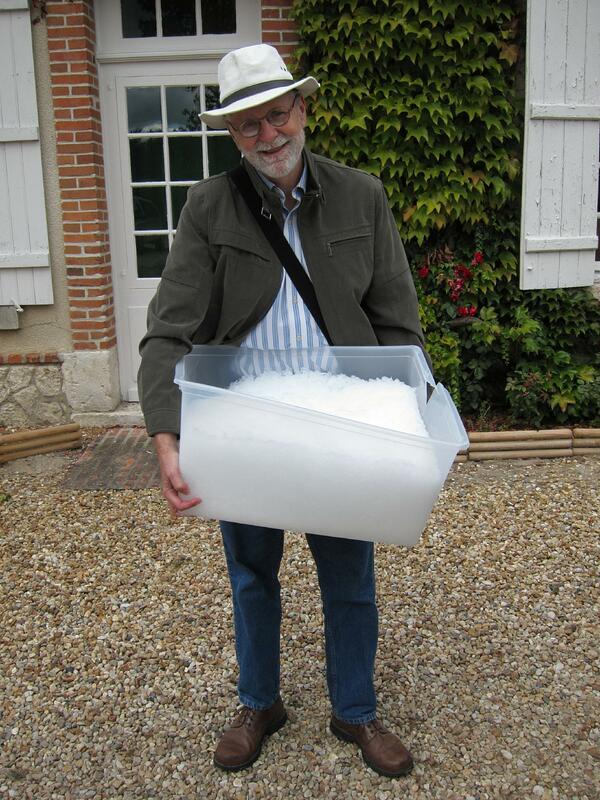 Obvious solution: a couple of cooler chests filled with ice. Easier said than done! First, nobody at the hypermarché had ever heard of cooler chests, even after I described the concept in crystal-clear French. Undaunted, I bought several plastic clothes boxes that looked waterproof, despite also being flimsy and uninsulated. Then I asked where I could buy ice. Answer: nowhere! Further answer: nowhere, except, just possibly, if I pled my case sympathetically, the fish department in the hypermarché might make extra ice for me to pick up the following day. Result: cold beer! And also a fun travel adventure. The memorial for Jane Mack was moving as well as surprisingly fun. We lit five candles, to reflect grief, courage, our memories of Jane, love and hope. (I was touched to be invited to light one of them, which I did for Nancy’s family as well as for my brother Steve, sister-in-law Noree, and nephew Andy.) We sang happy songs that Jane had loved, and more serious songs composed for the occasion, all led by Judy on her guitar. There were many amusing and touching reminiscences, including a recording of Jane’s own family memories. I realized that I probably knew Jane the longest of anyone there, since I’m a couple years older than Jackie and Judy. The proceedings were powerfully moving, yet rigorously secular, because that’s what everyone wanted, as well as what Jane would have wanted. I mentioned how well this fit with the principles of Humanism but my cousins were more interested in living the way they saw fit than embracing a label. 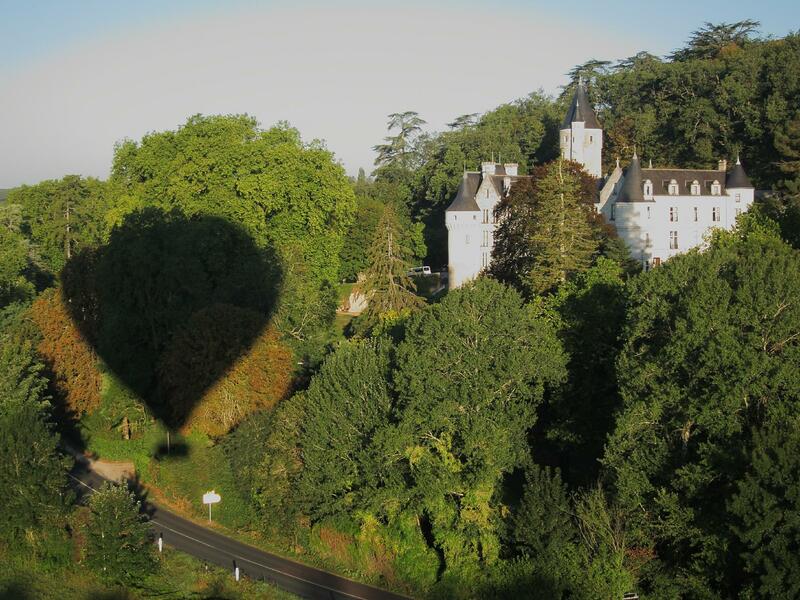 The high point of the visit — in more ways than one — was an ascension in a Montgolfière (hot air balloon) over Château de Chenonceaux and environs. One photo will give you a taste (though it’s a different château). 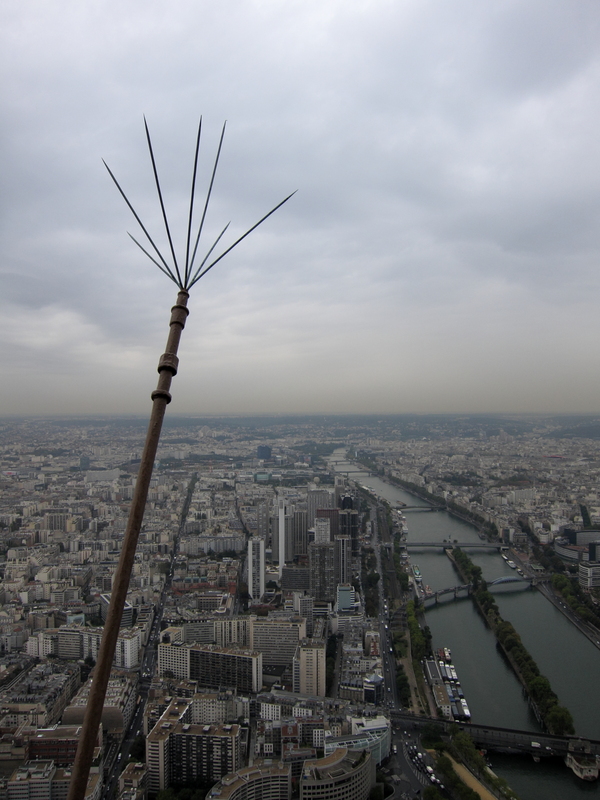 There’s a full photo set at this link: Montgolfière Photos. Dropping off the car was once again stressful, since there was a demonstration at Place d’Italie that brought traffic almost completely to a stop. At one point I was closing the gap with the car in front when a motorbike passed me on the right and cut across the closing gap to the other side of the car in front of me; I slammed on my brakes to save him; luckily the guy behind me was on the ball and didn’t rear-end me. I ended up returning the car to the same obscure garage near Gare Montparnasse that Jared and I had found a few days previously. It was a relief to get back to Lisa’s and Ali’s to join Jackie and David’s family for a farewell Chinese dinner, bien arrosée in my case at least. Today I’ve done nothing but laundry, blogging and a little reading. A day of downtime is just what the doctor ordered! 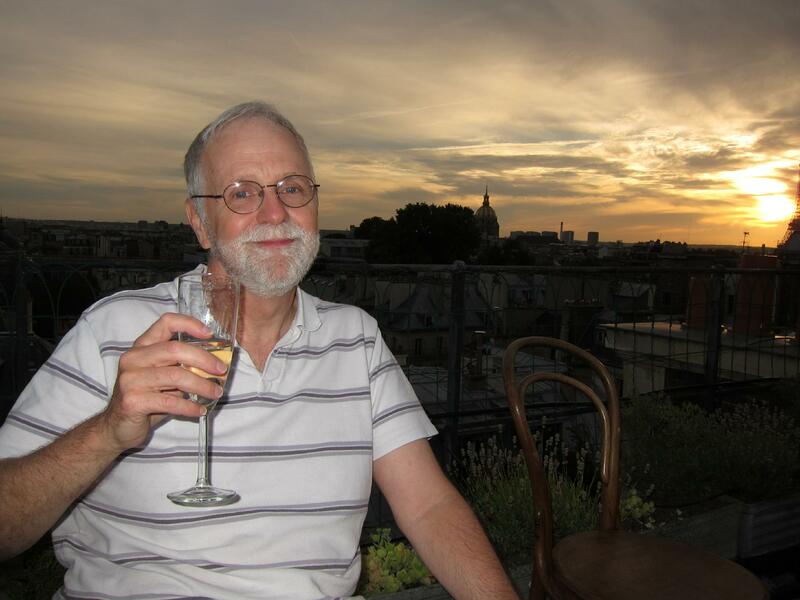 Gerry arrives tomorrow morning, for his first visit to continental Europe. Jared spent the evening with his former classmates, while I met up with a friend for a drink at the Experimental Cocktail Club, a few doors down. This evening there was a disk jockey, and I enjoyed his spinning as much as the cocktails themselves. We said our farewells the next morning. Jared took the train to Lausanne and I headed off to L’Ejumeau.